Etch A Sketch magic screen! Upgrade any Photo U package to 3-D! Using anaglyph filters and digital programming, our Etch Archivists turn your Etch A Sketch® Photo print into a 3-D masterpiece. Just put on your red and blue 3-D glasses to see the amazing effect! Upgrade any Video U or Project U package to 3-D! Using stereoscopic filters and a special 3-D screen, the Etch Pod projects a live 3D image of your sketch being created! Just put on your custom grey glasses to see the amazing effect! 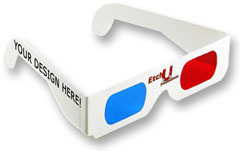 3-D glasses can be customized to the theme and logo of your party!